Bunion surgery is a treatment option done to correct bunions. Bunions are often painful deformities of the foot that require surgery to correct and alleviate pain. There are many different types of bunion surgery that range from mild to severe. Bunions are formed when the big toe beging to grow into the second toe. The big toe will 'bend' at the joint. This can cause irritation from rubbing on shoes, difficulty wearing shoes and many other problems. The cause of bunions is usually genetic, however, wearing shoes that are too tight or an injury can irritate the situation. More women than men will develop a bunion and bunions can also develop in children. Before your doctor will perform bunion surgery, they will explore the conservative options. Wearing wider shoes, using padding to prevent friction and custom inserts to correct gait. These options will usually not help a severe bunion but can prevent a mild case from getting worse. 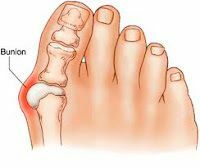 In general, bunion surgery calls for an incision in the top or side of the big toe joint and removal or realignment of soft tissue bone to relieve pain and restore normal alignment to the joint. The surgeon may insert tiny wires, stitches, or screws to stabilize a severely deformed joint. If your bunion is painful or you are worried it's getting worse, call our office to discuss your best treatment options.